For the right gear for the right job, go to Big Sky Country, online at BigSkyCountry.com. 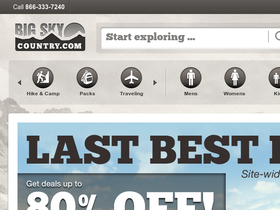 BigSkyCountry.com is the one-stop-shop for all your outdoor adventure needs. BigSkyCountry.com offers hiking gear and attire, camping equipment including tents, cookware, and sleeping bags, electronic devices, GPS, cameras, snowboards, helmets, skis, ski boots, snow jackets, climbing attire, packs and bags, travel accessories, a variety of shoes and footwear and much more for women, men, and children. BigSkyCountry provides the tried and true brands in the outdoor arena, like Columbia, Merrell, Mountain Hardwear, Sanuk, Burton, DC, Adidas, and many more. But before you head on out to the great outdoors, be sure to gather all the latest BigSkyCountry promotions, BigSkyCountry.com discounts, and BigSkyCountry.com coupon codes found here at RetailSteal.com. BigSkyCountry.com ships within the 50 U.S. States only. BigSkyCountry.com does not ship to P.O. Boxes, APO/FPO addresses, U.S. territories outside the 50 States, freight forwarders, any overseas address, or temporary address. BigSkyCountry.com offers shipping rates based on shipping method and offers free ground shipping within the 48 contiguous states with orders over $45. Head over to BigSkyCountry.com today and use our coupon code to save 20% on all regular priced merchandise. Click the link to shop now. Shop at BigSkyCountry.com today and enter our coupon code at checkout to receive a 20% discount on regular priced items. Click link to shop. Hurry over to BigSkyCountry.com today and save up to 50% on sale items. Go to BigSkyCountry.com for all your outdoor gear and enjoy free ground shipping on orders over $45. Offer applies within the 48 contiguous U.S. States. Click link to shop! Go to BigSkyCountry.com today and save up to 50% on select Ocean Minded sandals for men and women. Click here to shop. Save up to 40% on Sorel brand items at BigSkyCountry.com. Get started now. For a limited time at BigSkyCountry.com, save 40% on ExOfficio brand shirts, pants, jackets, and more. Click here to shop. Save between 35-40% on DC accessories, jackets, footwear, and more at BigSkyCountry.com. Click link to shop. Check out BigSkyCountry.com today and save up to 30% on select Adidas shoes. Click link to shop. Shop today at BigSkyCountry.com and save 30% on all GoLite attire and accessories. Click link to activate savings. Click here to enjoy 20% savings on Forum snowboards at BigSkyCountry.com. Shop today and save.